NOTICE: CHOKING HAZARD. Children under 2 yrs. can choke or suffocate on paper confetti. Adult supervision required. Keep confetti away from children. Confetti is fun, shimmery and high quality. 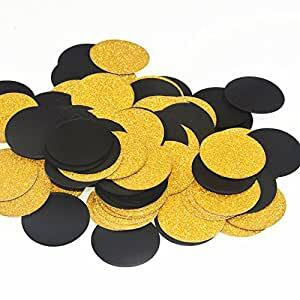 Use them to stuff your party invitations, decorate tables, embellish presents, or throw them in the air at a wedding, bachelorette party. This Is A Great Party Decorations For Many Occasions Including Fraternities, Sororities, Perfect Party Decoration For Halloween, New Years, Christmas, Birthdays.